When a mutual friend offered to introduce Emily Robb and Ravi Pillay, both said, “no way.” Neither was interested in a long-distance relationship—she lived in Buffalo and he in Manhattan. But their friend persisted. “He was like an Indian parent,” Emily jokes. They first connected on the phone, then later met in New York City. They’ve been together since (and now call Harlem home). Their ceremony mixed both their cultures and upbringings, said Emily. But while a traditional Indian wedding can last for three days, they distilled the most important parts into one hour. Both the ceremony and reception took place at The Buffalo Club, Emily’s dream venue. “I spent a huge amount of my childhood there,” said Emily. The couple searched all over Jackson Heights in Queens for Ravi’s beautiful blue “kurtha”—the traditional wedding attire worn in Southern Indian wedding ceremonies. He wore his father’s shoes. Before the ceremony began, a fire was lit to indicate the presence of God. 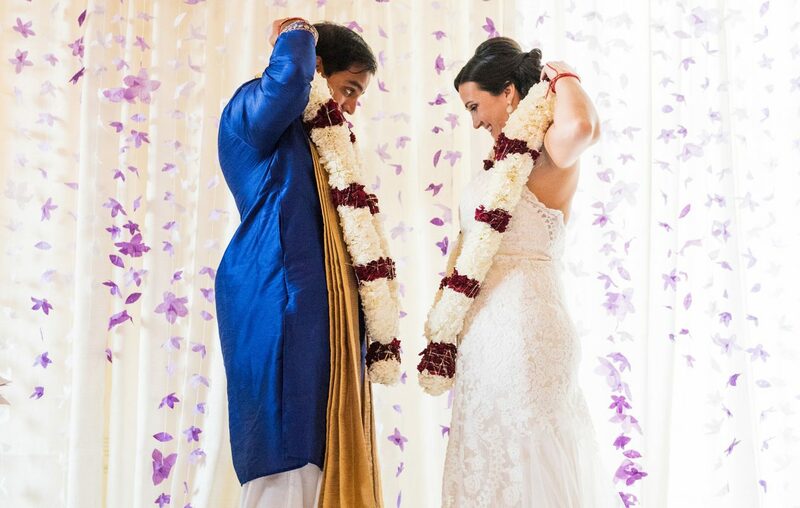 The uruli, or container holding fruit, symbolized good health, and Emily and Ravi presented each other with flower garlands to represent their acceptance of one another and the marriage. Emily was also given a sari during the ceremony, a traditional gift from the groom’s family to show his commitment to provide for the bride’s material needs. 127 guests attended—“small for an Indian wedding,” said Emily, with 700-800 being more typical—some coming as far as India.